Geek Stuff- Pop Culture Podcast and Community » Blog Archive » Orange Harvest? See I had feeling…Check out this story from the website MiceChat. Looks like there are some definite plans for some new Star Wars stuff in Disney Land at least one of which is a Speeder Bike coaster! All I know is there better be some info about WDW getting some Star Wars stuff as well. Disney Land is far too hard for me to get to personally. Ha! 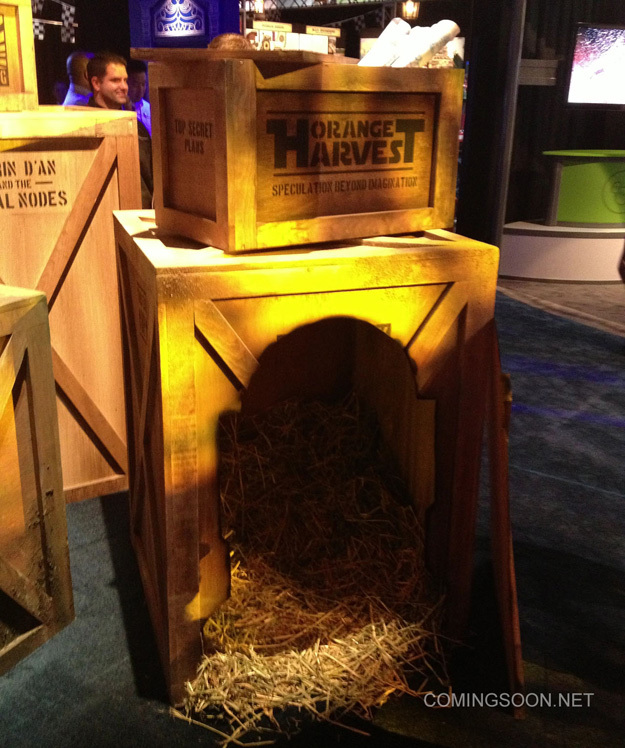 Again using ComingSoon.Net as a source of information and photo’s for D23 another thing spotted on the exhibition floor was some teaser stuff for “Orange Harvest”. Of course most of us know by now that “Blue Harvest” was the production shooting name for Return of the Jedi so the possibility is that this is something Episode 7 related. But based on the other crate you can see that says “Figrin D’an and the Modal Nodes” and the tag line “Speculation beyond Imagination” I think this may be a reference to the Disney Imagineers and could be the tease for the new Star Wars themese ride/section of the the Disney Parks which we speculated earlier would have something to do with Tatooine. Of course the busted R2-D2 shape in the side of another crate is a cute touch too. What do you think?